On 3rd March 2005, a meeting was held in Dudley, England to discuss the possibility of producing a new hymnbook to serve traditional evangelical churches in the twenty-first century. Aware of others throughout England and Wales who sensed a similar need, three Welsh ministers took the initiative of calling the meeting, and some two dozen men gathered that day. The need for something new was discussed and, with overwhelming agreement regarding its character, there was a clear mandate for action. It was clear that although not popular with some, these principles were very important to many, and that such a book would meet a real need in the churches, providing a traditional hymnbook in a contemporary form. In common with many traditional books, the first 150 numbers correspond to the 150 Psalms of the Old Testament. These are metrical Psalms rather than Psalm paraphrases, and have been taken from The Psalms of David in Metre published in 1650. This is commonly known as The Scottish Metrical Psalter, and is without doubt the classic metrical Psalter within the English-speaking world. As has been done by others in the past, these renderings have been lightly edited. 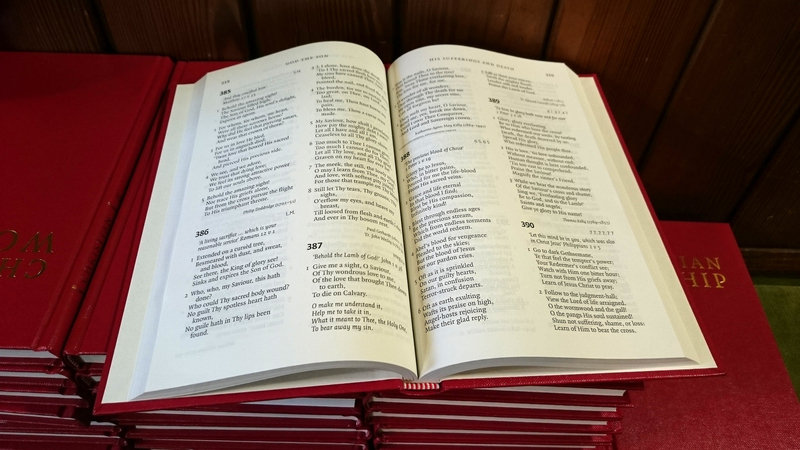 Our desire has been to remove unnecessary archaisms and unfortunate rhyming, while retaining the immediate recognition of all who are familiar with this well known and much loved Psalter. It is our deep conviction that the almost non-existence of metrical Psalms in the worship of many evangelical churches is highly regrettable, and it is our sincere hope that the inclusion of a complete metrical Psalter will go at least some way in helping to redress the balance (Eph 5:19, Col 3:16, Jas 5:13). As in most evangelical books, many paraphrases of Psalms and other Scripture portions are included. These are not given a section of their own, but are included among the traditional hymns under the appropriate subject headings. It is the testimony of many who have used books which place Scripture paraphrases in a separate section that these precious portions are often either forgotten or ignored, and tend to be sung very infrequently. It is hoped that marrying them to the themes of which they speak will make them more accessible, and cause them to be used more frequently to the blessing of all who sing them. These portions are identified at their head, and an index of all such is included for reference. The major part of the book is comprised of some 1,041 traditional hymns. Many of these are older hymns that will be familiar to most and favourites of many. However, we have also included a significant number of newer hymns by living authors, as well as incorporating many longer-standing hymns that have fallen out of use but which are worthy of recovery. Although the majority of these traditional hymns would be immediately recognisable to many Christians, it is hoped that this collection is both familiar and fresh, and will be used of the Lord in bringing new heights and depths to our gatherings for worship. One way in which this book goes against the tide is in its retention of the second person singular pronouns, ‘Thee’, ‘Thou’, and ‘Thine’. To many this is simply archaic, but to us it is a matter of accuracy. The editors of one recent book seem to suggest that the use of these pronouns is positively unbiblical, ‘Some Christians still prefer to address God in the second person singular … They enjoy our respect and their own freedom. However, there is no biblical basis for this practice’. However, we would argue the precise opposite. They may reject the second person singular pronouns in favour of supposed increase of intelligibility, but as the Scriptures in Hebrew and Greek use the second person singular pronouns, our retention of them can only be both more accurate and more biblical. What to include and what to exclude is always difficult. A balance is required between objective and subjective, strong doctrine and felt experience, the sovereignty of God and the responsibility of man, the darkness of sin and the light of salvation, the reality of Hell and the glory of Heaven. However, what should be done with authors whose theology is regarded as seriously errant – whether they are Romanist, Ecumenical, Unitarian, Charismatic or whatever else. Some have argued that hymns should be judged solely on the merit or otherwise of their words, while others would argue that everything must come from an unquestionably orthodox source. Our policy is something of a middle way. We would not want to argue with C. H. Spurgeon, who in his Preface to Our Own Hymn-Book wrote: ‘Whatever may be thought of our taste we have used it without prejudice; and a good hymn has not been rejected because of the character of its author, or the heresies of the church in whose hymnal it first occurred’. However, in the days in which we live, we are facing something Spurgeon never faced, namely the introduction of a whole new genre of material to worship, with the informal offerings of the Charismatic Movement, accompanied by its multi-instrument worldly-idiom music. Some more traditional hymns from this quarter may prove to stand the test of time, but many more will undoubtedly sweep numerous churches into oblivion in the process. Therefore, regarding authors who have departed this world, we have made Spurgeon’s practice our own, but regarding those who are still living, we have endeavoured to include only those hymns written by authors of known orthodoxy. We appreciate that there will be those on both sides of the argument who will question the rightness of our policy at this point, but we trust that they will acknowledge both that it is a tenable policy to hold, and that we have sought to implement it faithfully. Throughout the production process we have been enormously indebted to the help, advice, and sheer hard-work of so many friends without whom this book would never have seen the light of day. We have been greatly encouraged by the generosity of the Lord’s people which has enabled a vision to become a reality, and above all, we are full of praise and thanks to Almighty God who has blessed us so markedly, and whose blessing we humbly trust will rest upon this book. In all the decisions taken, we have sought to unite rather than divide. For those of our brethren who want a book of a significantly different ethos, there are such available on the market. However, for those unhappy with other recent offerings, we have sought to produce a book that is clear about its parameters, but within which it seeks to be as broad, representative and biblically ecumenical as possible. It is our prayer that what other books have done in past generations this would do today – rallying those of like heart and mind, encouraging us to see that far more unites us than divides us, and enabling us to continue the greatest work known to man, namely worship ‘in spirit and in truth’.